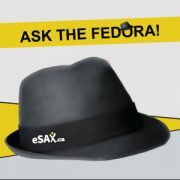 Today our #AskTheFedora offers more tips for remembering names at networking events. To me, one of the most challenging things about networking is trying to remember everybody’s name. Because I wear a very distinctive hat, pretty much anybody I have ever met will remember me (plus I always wear a name tag so they even know my name)! But when I meet hundreds of people in-between meeting them for the second time, it’s a tough balance trying to remember everyone’s name. What I like to do is try to remember something specific about that person. Maybe they have the same kind of car as I do, or they grew up in the same city as I did so that I’m able to connect with them. Don’t write off networking if you want to do what is best to help your business succeed. If you are one of the networking “haters”, watch what Jarrod has to say to you! http://esax.ca/wp-content/uploads/2016/11/eSAX-2016-logo-200.png 0 0 eSAXnetworking http://esax.ca/wp-content/uploads/2016/11/eSAX-2016-logo-200.png eSAXnetworking2018-04-22 19:04:122018-04-22 19:04:12The Weekend Warrior Networker, Treat Your Business As A Full-Time Gig!